Here’s a look at the first leg of the trip, the Rim to Rim from south to north. 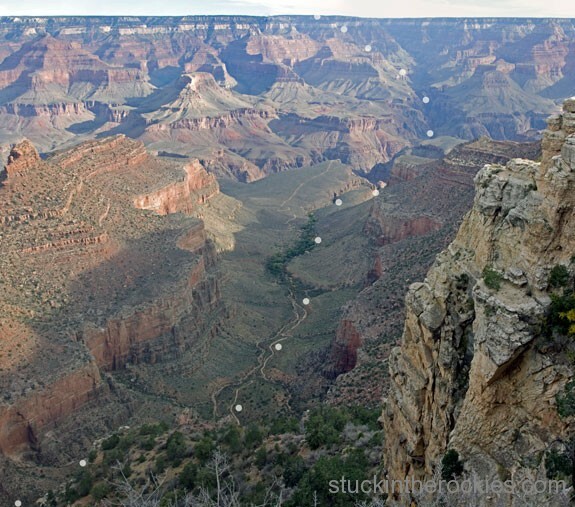 It might not look that far but remember, it’s not called the Grand Canyon because it’s small. Click to enlarge. 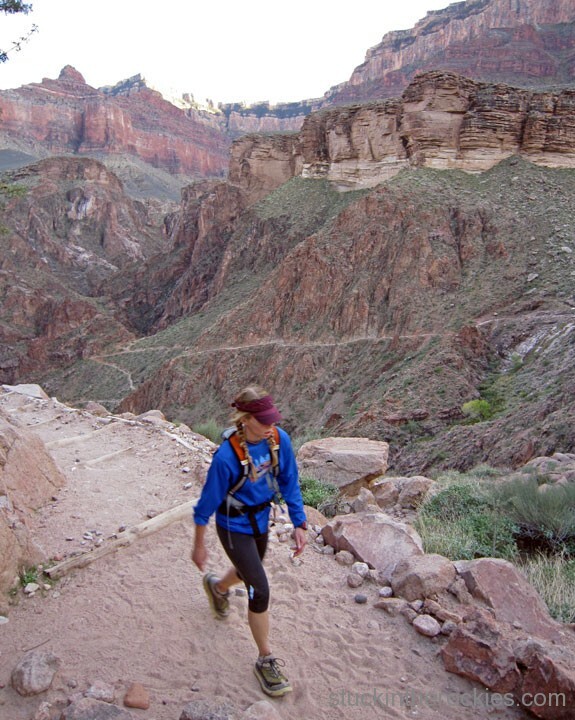 Here’s a good one if you’re a fan of the long day– start at the South Rim of the Grand Canyon, run nine-plus miles down to the Colorado River and ascend some 14 miles up the other side to the North Rim, and then come back. What’s it all about? Well, it depends on your perspective. A seasoned mountain runner might say it’s no big deal, that it’s really just two big hills. True, I suppose. At its most basic level that may be an accurate description, but that’s really a bit oversimplified. Put in a different, slightly more sensational tone, it’s running a double traverse of the Grand Canyon, which to the uninitiated might sound downright crazy. The one-way elevation profile, courtesy of the NPS. Well to Christy and me, the Rim to Rim to Rim, or R2R2R as it’s written, falls somewhere in between those two descriptions. 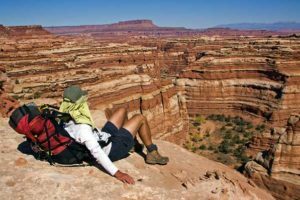 It’s not quite crazy because, depending on how you go, it’s between 40 and 50 miles in length and nowadays that qualifies as a typical “long day” for some. 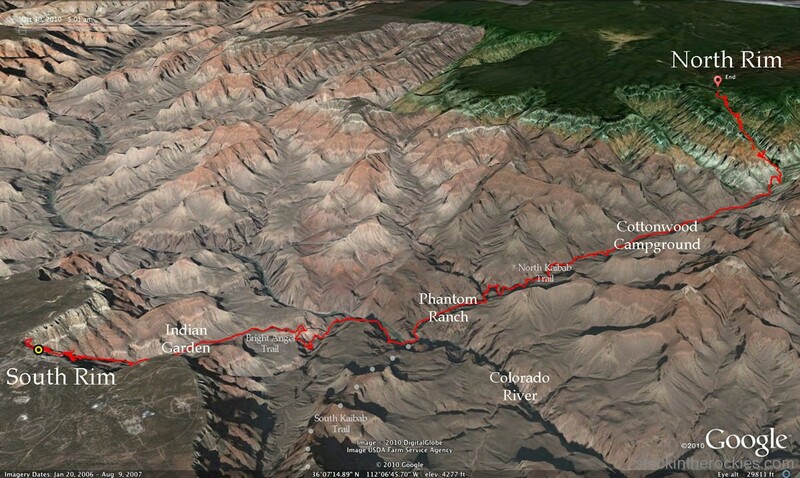 But it’s also much more than just “two big hills” because there’s nothing hilly about gaining 11-12 thousand vertical feet in a day, and when combined with the mileage and hazard potential of the desert environment, it needs to be taken a bit more seriously. Which is a good segue to our day. A few months back, while putting together a fall climbing/road trip to Joshua Tree, CA and Red Rocks NV, Christy and I thought it might be fun to break up the drive by stopping at the Grand Canyon and running the R2R2R on the way. Just a casual scoot across and back. Easy, right? Although we’re used to taking on sizable challenges here and there, we showed up particularly flat-footed for this one. 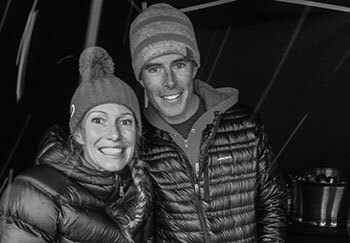 Our somewhat cavalier attitude towards running it– that we could just do it off-the-couch, after spending our fall exclusively running flat miles– resulted in a little bit of suffering out there. To be completely honest, it was really tough. 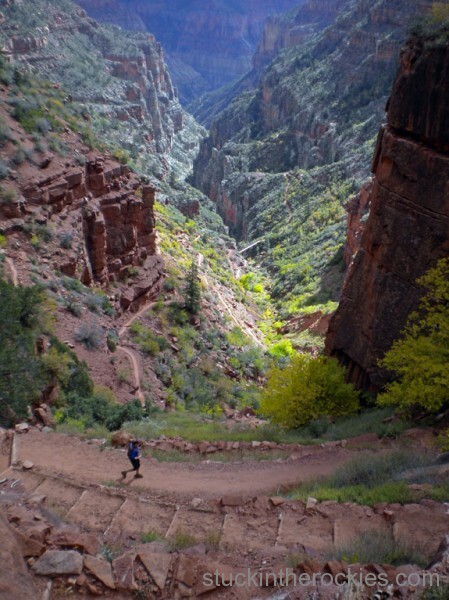 Halfway home, on the way back down from the North Kaibab trailhead. 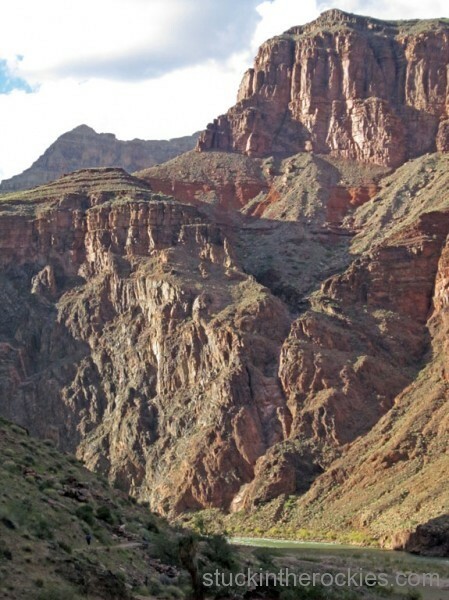 If you look closely you can see the trail meander down the canyon. Excuses aside, and we came up with quite a few by the time it was all over, the R2R2R is a really big day– it took us 14 hours to complete the 47 mile course. 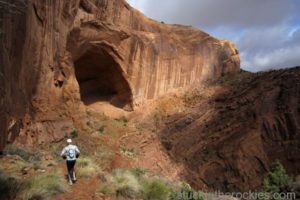 And even though there were never plans to go fast, our assumption that we could finish feeling good and in a reasonable time, having done no real specific training, was a little short-sighted. 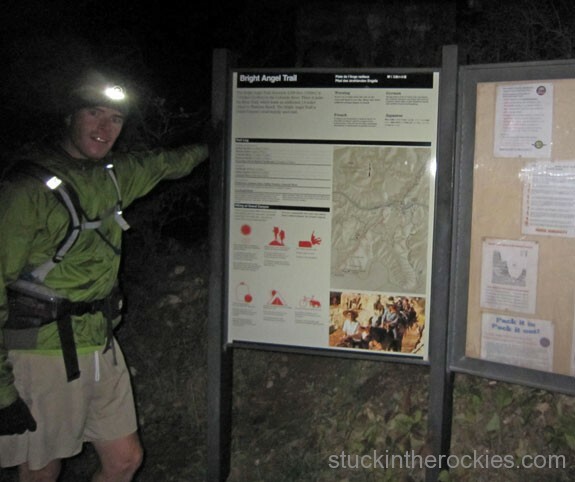 As nightfall approached on the return trip up Bright Angel, and we were out of food and bonking with more than a few miles to go, well, without going into the details of the conversations, I’ll just say our enthusiasm for the goal had worn thin. You can read between the lines there if you like. As a testimony to the day though, even after our flailing finish, it only took a few hours before talk of returning next year for redemption began. It’s interesting how the mind works. For the curious readers out there, check out Andrew Skurka’s website for helpful info on some of the logistical considerations. And if the R2R2R sounds like more of an undertaking than you like, consider the one-way Rim to Rim as an alternative. Either way, the one-way or round-trip is well worth the effort. 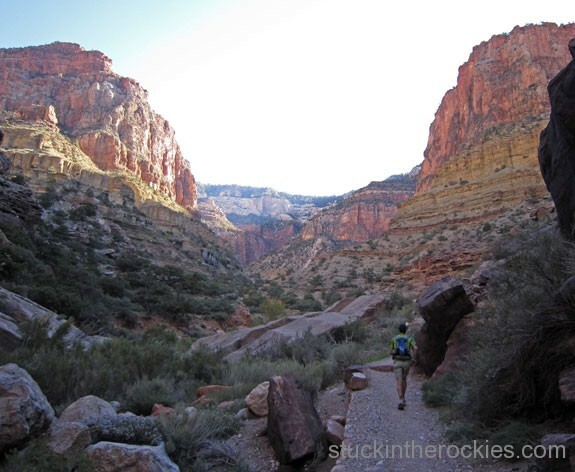 Apart from the obvious selling point of seeing the Grand Canyon in this fashion, it might be the most official, unofficial ultra-distance event out there. I can’t think of another trail/course that is so revered and participated, yet has no associated event or organizer. 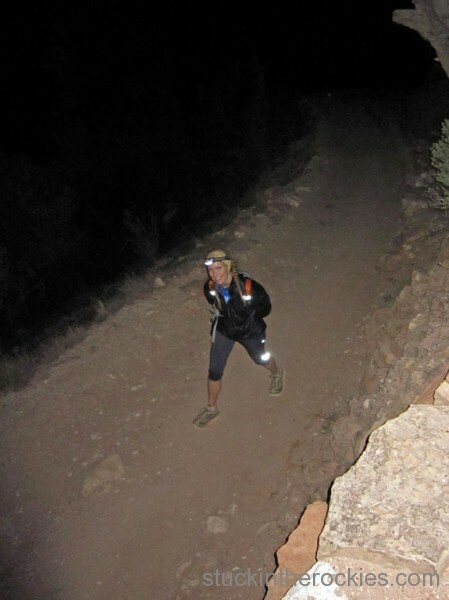 Much like a mountaineer’s to-do list of classic peaks, if you ask anyone who has been running trails for a while about the R2R or R2R2R, if they haven’t already run it, they’ll likely be hoping to someday. The proverbial “walk in the park” laid out before us. 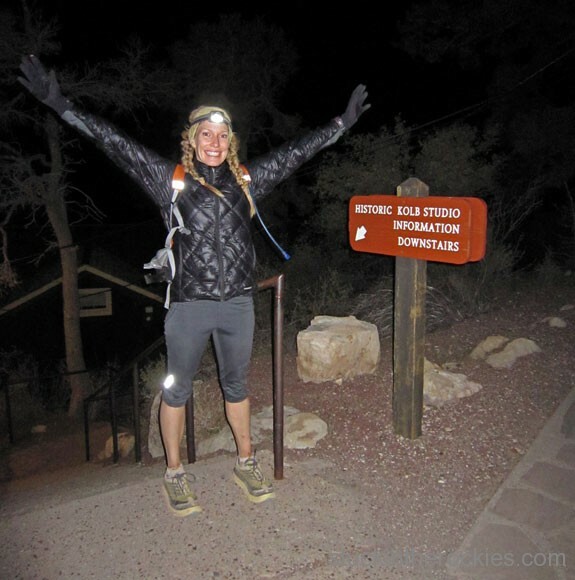 5 am, Bright Angel trailhead. The first hour and a half were in the dark and it remained chilly for a while after dawn. Once down at the Colorado River we cruised along the water to the Silver Bridge, in the foreground. 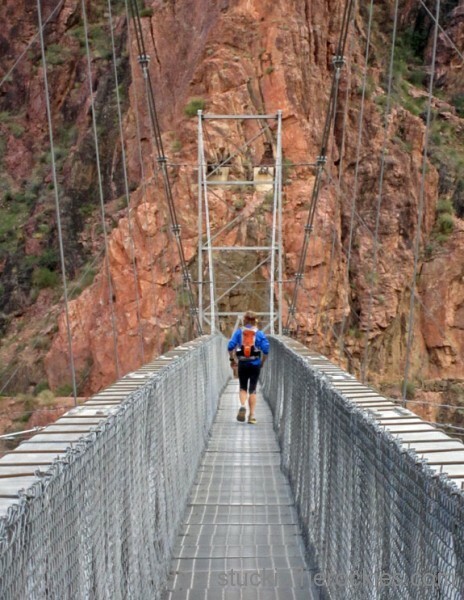 The Kaibab Bridge can be seen behind it. Somewhere along the North Kaibab Trail. We weren’t in the sun until near Cottonwood Campground. 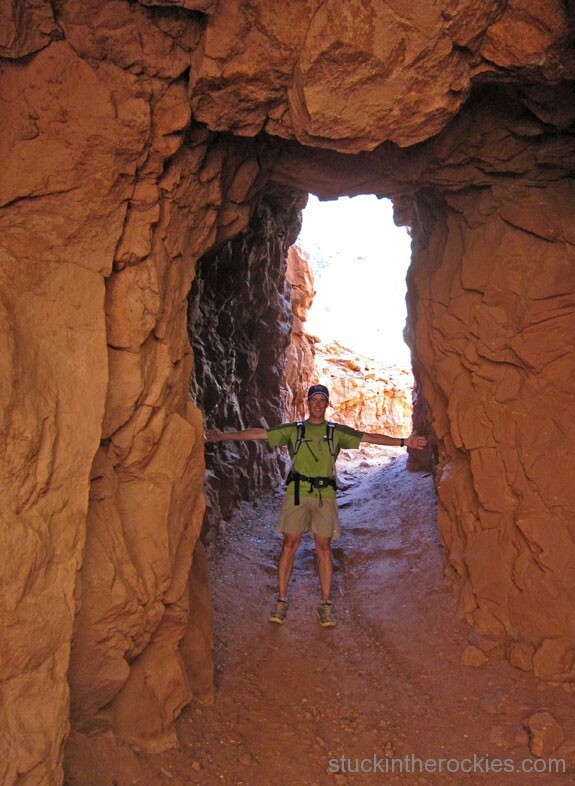 The Supai Tunnel, about a mile and half from the North Rim. 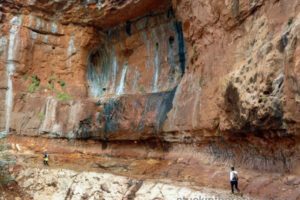 “Sorry folks, the parks closed, the moose out front should have told you.” We weren’t expecting the water to be off at the North Kaibab trailhead. Bummer. And down further. You can see the trail skirt the ledge in the distance. It was five or so miles to the next water fill up, which on a cool, cloudy October 30th wasn’t too big a deal. 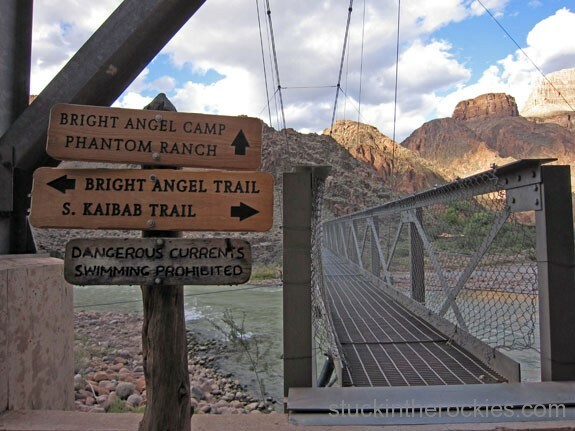 After filling up and off the steeps of the North Rim, it was a cruise to Phantom Ranch. On a sunny day closer to summer we could see the desert heat becoming a real issue. 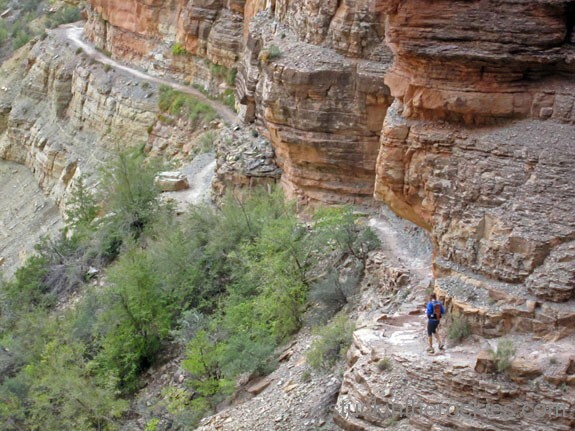 The cool narrows section of the Lower North Kaibab trail. 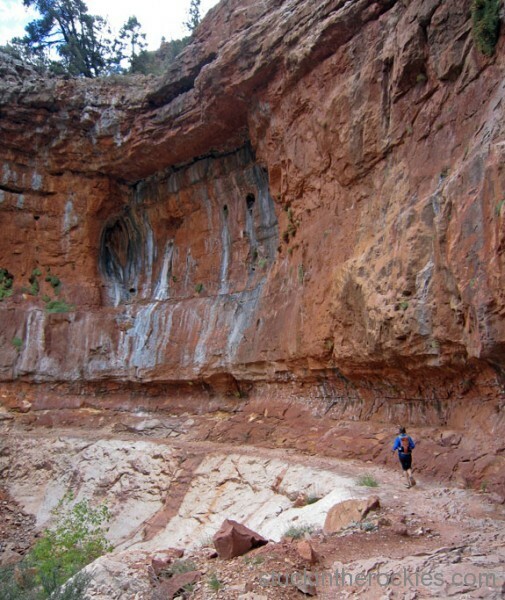 There a four bridges in this meticulously carved out section above Phantom Ranch. The Phantom Ranch Canteen was a quick stop for a couple of lemonades before taking on the second “hill” of the day. Inside the Canteen it was full-on Happy Hour, with all the ranch guests who muled down there for the night “tying one on” and making us wish we were done and doing the same. Trip two across the Silver Bridge. 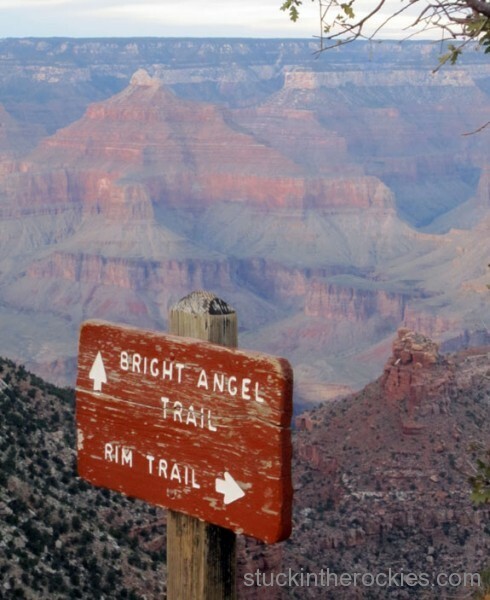 There’s only one trail to the North Rim, the North Kaibab Trail, but there are two from the south, the Bright Angel and the South Kaibab, the latter of which is a few miles shorter and can give you the option of a 41 mile R2R2R opposed to 47 mile route we took via Bright Angel. 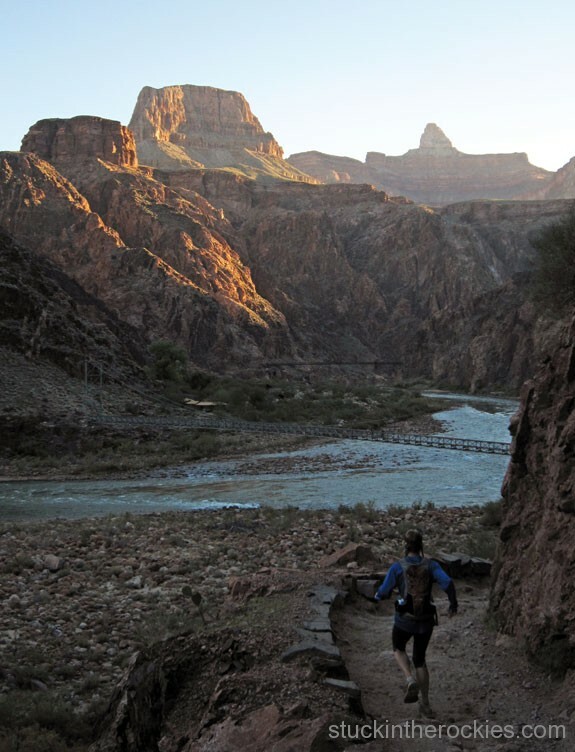 A hard-to-see Christy runs along the Colorado in the afternoon light. Nearing Indian Gardens, Christy was starting to feel “over it” and I would soon agree. Bundled up against the cold like in the morning, we were reduced a full power hike by the steep trail and the late miles. The darkness only made it drag on. A photo from the South Rim the following morning, looking down Bright Angel and across to the North Rim. Just a walk in the park, right? Next year, sub 12! Who’s in? When last weekend’s weather forecast wasn’t looking conducive to outdoor activities around Aspen, Christy and I decided to head to Moab. Man…THIS is cool. I’m not a long distance runner, but seeing the park like this looks fantastic. I’m in for the “sub 12”. That’s one way, right?! Ahhhh, nothing like a lazy river trip. Christy must have redone her ‘do… the shrimps are lookin’ good:) congrats, you crazy kids! nicely done! Awesome run, and fun pictures. #1 sure looks like a looooong way down. Aside from the fact that you’re in the Grand Canyon (!) that trail itself looks really great. 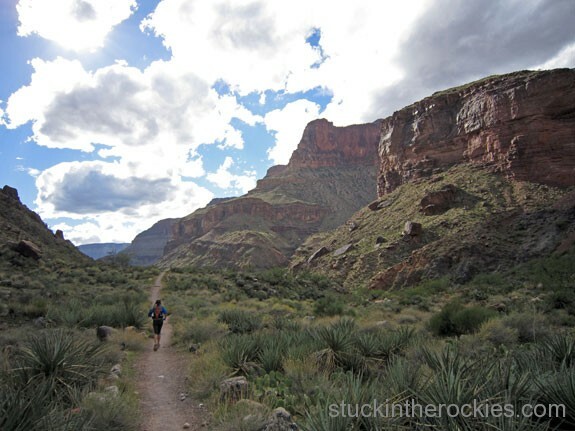 I love rocky trails like that along canyons, i.e. Moab, Fruita. Some day. Spring or fall. With a water filter and a good partner. Nice Call Fry! I did, in fact, “redo” the shrimps during the run. Was feeling very good about the move, funny that you picked up on that. Only a true Pacer/BFF would know that jedi secret! Joel- You can do the one way so long as you don’t let us into the car you shuttled to the North Rim, even if we beg. We both admitted a willingness to call it good after the one-way, if it was possible. KP- if we had three weeks and a permit(and everything else), you’re right, it would have been much more fun to float and drink beer for 3 weeks. Jen- Let’s talk. After going through the pics we can’t wait to get back. Amazing. 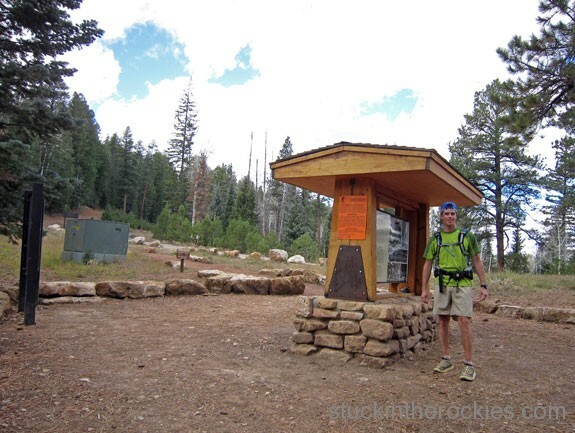 I did this trip in the spring and that north rim was closed – as the kiosk was still buried in snow. Your shots are incredible and brought back excellent memories of that wonderful place and run. This is something I’ve been wanting to do since going one way across the park a few summers ago. 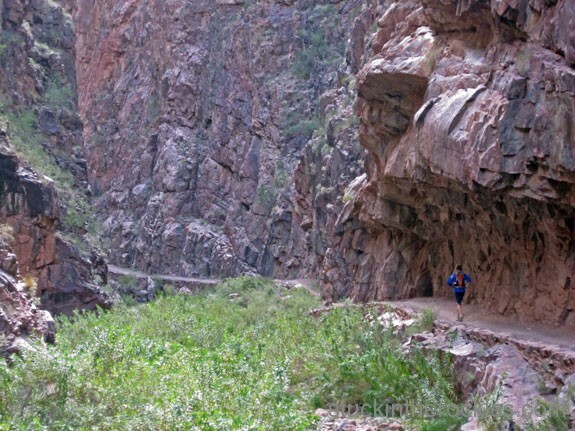 It takes like 5 hrs to DRIVE from rim-to-rim, so running back is probably the easier way to do it, anyways! If you guys go back and do this in 2011, keep me in mind! mtnrunner2- the trail is really well established, though it’s kind of tough at times with all the log steps in the steeper parts. George- Thanks. 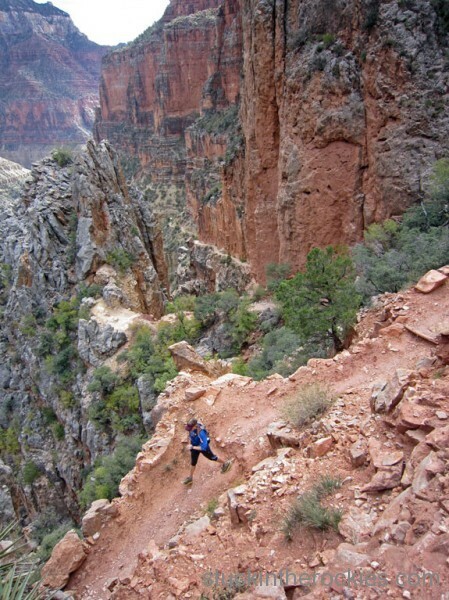 Next time we go South Kaibab and take it more seriously(faster). I can’t believe I read Dave Mackey did it in 6:59- that’s nuts. Jake- Sure. It’s definitely hard to make the one-way practical w/o support. 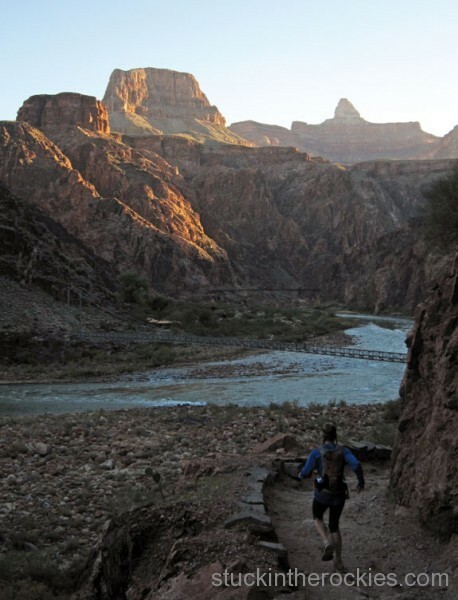 Ricky Gates told us he had a backpack dropped off at the N. Rim and camped after running the South-to-North, and then walked(backpacked) back to South Rim the next day(he missed the unofficial 3:08 one-way record by a couple of minutes). And we met some people from Flagstaff who did the one-way in two groups and in opposite direction, driving each others cars home so there’s no shuttle needed. Not a bad idea if you can coordinate it. Great trip. I have to say I’ve always been partial to a good Kaibab. The best one I can remember was in Glasgow after about 4 hours in the famous Horseshoe Bar. Rod- Good to hear from you. It’s an impressive place for sure and no wonder you’ve spent so much time there. As for interest in the Salmon? Definitely. We did R2R (north to south) a couple of years ago and paid a driver (that ran shuttles for river crews) to drive my car round for us. Split between four of us it was only $20 each more than the goddamn awful bus. For anyone wanting to do just one way that is what I would recommend. Aint nothing like seeing your car parked at the trailhead when you need it most. 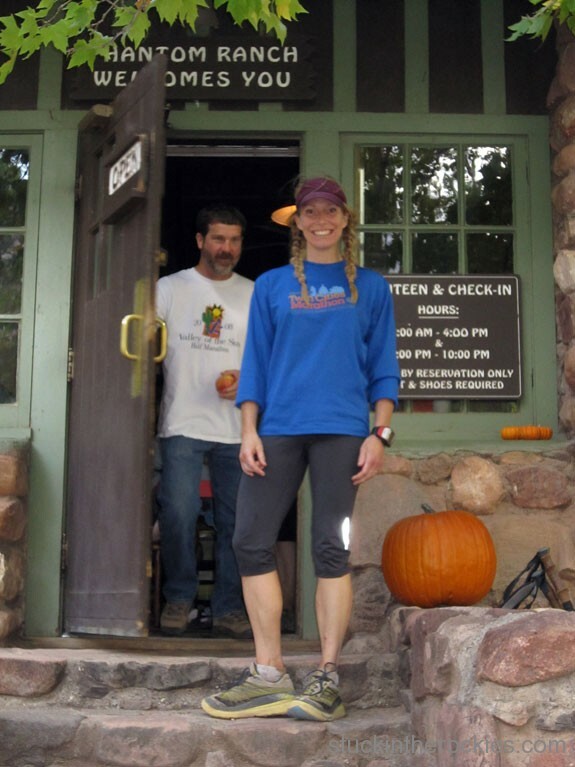 Another recommendation – the martinis at the South kaibab lodge were out of this world and very critical to recovery. Awesome pics as always Ted. At least you could go “off the couch” and actually pull that one off. Amazing run and glad you are already thinking of a return visit! Enjoyed that previous Fruita footage, too. Sure sounds like a lot of interest out there. Maybe we should organize more of a group outing next time. I’m down like James Brown! Good luck at JFK!